At Croatian Villas we’re reminiscing of the glorious summer that’s past and what better way to relive our fondest memories of sipping fine Croatian wine whilst dipping our toes into the warm Turquoise waters of the Adriatic than with a photo competition of all your best Croatian holiday snaps? 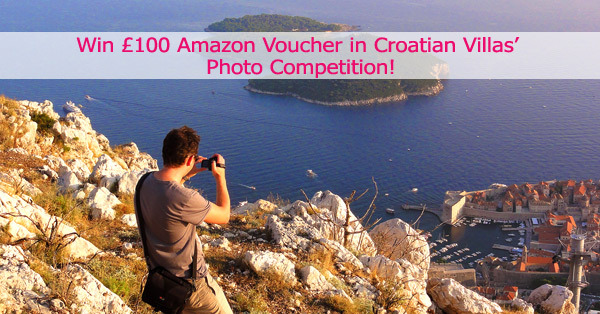 Head on over to our Facebook Page and post your favourite Croatian photographs on our wall, we’ll simply add your entry into our ‘Photo Competition 2010’ album and the winner will be decided by you! – The photo with the most clicked on Facebook will be our winner! Be sure to invite all your friends over to our Facebook Page to vote for their favourite entry. Please ensure all photos submitted are of Croatia. Entries should be submitted by Sunday 12th December. By submitting a photograph, the entrant declares that the photograph is their own work and free of any copyright. In submitting to the competition, you agree to grant Croatian Villas a royalty-free, non-exclusive license to publish and otherwise use the submitted material. You still own the copyright to everything you contribute. Your entry should be submitted via the news feed (wall) on the Croatian Villas Facebook Page . On posting your image on the news feed, Croatian villas will upload your photo into the ‘Photo Competition 2010’ album with the entrants name detailed in the photo description box. The photo with the most ‘likes’ by the closing date will be deemed the winner. Pictures deemed inappropriate will not be accepted into the competition. This includes images that may be offensive, previously published, or copyrighted. Please ensure you have consent from any persons featured in your photographs. If you submit pictures of children aged under 18, please ensure you have consent from the subject’s guardian before submitting your entry.